Much about India's economy and aid flows has changed in the last two decades. India's growth rate has quickened since economic liberalisation, the poverty head count has fallen and the volume and composition of its aid have changed as new issues of climate change and the environment have emerged.. 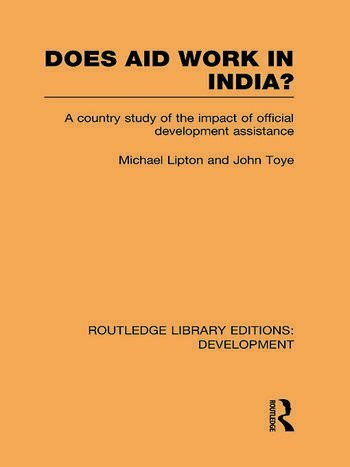 Yet Does Aid Work in India?, first published in 1990, remains of great interest as a study of aid effectiveness in India's pre-liberalisation era. It identifies those sectors where aid-funded interventions succeeded, and where they failed. It explains how India avoided problems of aid dependence, and managed the political tensions that are associated with aid policy dialogue. More generally, it contains a useful commentary on and criticism of donors' aid evaluation procedures at that time and it highlights donor efforts in the difficult area of institution building. Despite the passage of time, many of the insights from India's earlier experience remain highly relevant to key issues of development assistance today.